Tis the season for all things pumpkin! If you are looking for a quick Thanksgiving breakfast, snack, or dessert, this pumpkin quick bread is perfect. After making pumpkin granola I had exactly the right amount of pumpkin puree leftover for this recipe, which is Fall in a loaf pan. I adapted the recipe from an awesome blog that I’ve only recently discovered called Skinny Taste, and she asserts that this is low fat – I’ll take her word for it! The recipe calls for just egg whites, which gives the already moist bread a light and airy quality that is just lovely. The main change I made was adding my own spices rather than pumpkin pie spice, and it resulted in a lovely, super gingery flavor. The pepitas on top lightly toast when baked and add a nice textural element. Chocolate chips would also be killer in this. 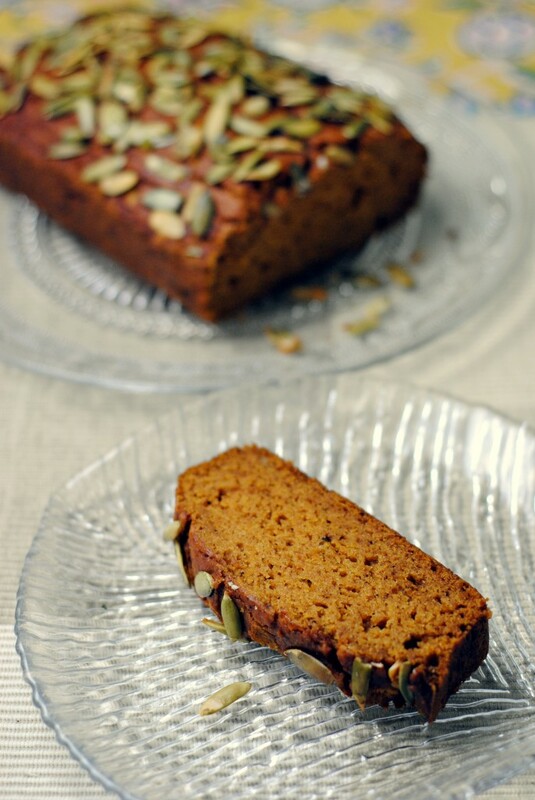 This gingery pumpkin quick bread comes together quickly and is perfect for Fall. It makes a great breakfast, tea time snack, or dessert. Preheat oven to 350°F. Grease a 9 x 5-inch loaf pan with baking spray or butter. In a medium bowl, combine the flour, sugar, baking soda, cloves, ginger, nutmeg, cinnamon, and salt. Set aside. In a large bowl mix oil, egg whites, pumpkin puree, and vanilla and beat until thick. Add flour mixture, then blend until combined. Do not over mix. Pour batter into the prepared loaf pan, top with pepitas and bake for 50-55 minutes, or until a toothpick inserted in the center comes out clean. Allow to cool at least 20 minutes before slicing. I love the pepitas on top of the bread. This looks so moist and delicious. I love pumpkin bread! The pepitas added some nice crunch, and it really was a lovely, moist bread. I love pumpkin bread too! Thanks for stopping by and Happy Thanksgiving! I love the ginger in this bread. I am making a loaf today. Happy Thanksgiving! I hope you enjoy!! Let me know how it turns out. And have a wonderful holiday! I love gingery desserts this time of the year. Yum!! The pumpkin seeds on top are too cute! Me too – gingery everything! Thanks Roxana! My wife loves pumpkin bread, I think the ginger twist sounds wonderful! Speaking of Thanksgiving, are you guys in TA this weekend? Let me know. Hey! We’re going to be there tonight but I think we’re going to head back on the last bus back. But I’m thinking I’ll come in next week or the week after for another play date 🙂 Happy Thanksgiving! I love the ginger in here, what a great idea! And the pepitas on top – yes please! Happy Thanksgiving! I’m so happy you like it Erin 😀 Happy Thanksgiving to you too!! That is one beautiful pumpkin bread. I do love the stuff! Thank you Carolyn! As do I. I just love quick breads of all kinds! Love the addition of ginger to this pumpkin bread. Sounds like a great Thanksgiving recipe! Thank you Divya! I think it would make the perfect Thanksgiving breakfast (you can’t totally starve yourself before the big meal!). Have a very happy Thanksgiving! I adore the pumpkin seeds on top too. They give a more exotic-organic feel to the bread. Afternoon tea time will be made extra special by this pumpkin treat. Thanks for sharing! Thank you Anna! I agree, the pumpkin seeds on top add a nice little something. Have a great Thanksgiving! Mmm! You had me at ginger. And anyone who knows me will vouch for that. Hah. Ha, I’m totally the same way! I can’t get enough ginger. Especially this time of year! Ohh Katherine the pepitas on top! I can feel the crunchiness! Thanks Eri!!! We had a lovely Thanksgiving, I hope you did too! Made these as mini muffins with the addition on 1 teaspoon baking powder. Moist and delicious. Will make again! Thanks Peggy! I agree 🙂 I hope you had a lovely Thanksgiving! What a gorgeous pumpkin bread! Love the peptita topping, too. Congrats on the Top 9 today!!! Looks great – I love the combination of ginger and pumpkin. This is almost pumpkin pie in bread form! Great recipe – thanks. I love SkinnyTaste. Do you think it would still be good without the pepitas on top? Thanks so much for linking up at A Little Nosh this week! Thanks for hosting Amy! I absolutely think it would still be good without the pepitas on top. They just add a little crunch and look nice, but the bread is great on it’s own. This sounds and looks absolutely delightful!! Has anyone tried 1 whole egg instead of the 2 egg whites?